The Mometrix guide is filled with the critical information you will need in order to do well on your POSS exam: the concepts, procedures, principles, and vocabulary that the Edison Electric Institute (EEI) expects you to have mastered before sitting for your exam. Our guide is full of specific and detailed information that will be key to passing your exam. Concepts and principles aren't simply named or described in passing, but are explained in detail. The Mometrix POSS study guide is laid out in a logical and organized fashion so that one section naturally flows from the one preceding it. Because it's written with an eye for both technical accuracy and accessibility, you will not have to worry about getting lost in dense academic language. Any test prep guide is only as good as its practice questions and answer explanations, and that's another area where our guide stands out. The Mometrix test prep team has provided plenty of POSS practice test questions to prepare you for what to expect on the actual exam. Each answer is explained in depth, in order to make the principles and reasoning behind it crystal clear. We've helped hundreds of thousands of people pass standardized tests and achieve their education and career goals. We've done this by setting high standards for Mometrix Test Preparation guides, and our Plant Operator Selection System Secrets Study Guide is no exception. It's an excellent investment in your future. Get the POSS review you need to be successful on your exam. If you'd like to get the POSS test score you deserve, to quit worrying about whether your score on the POSS test is "good enough," and to beat the test taking game, then this might be the most important message you read this year. 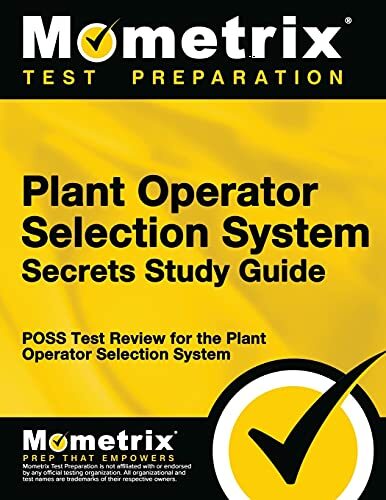 Our comprehensive study guide for the Plant Operator Test is written by our POSS test experts, who painstakingly researched the topics and the concepts that you need to know to ace your POSS test. Our original research into the Plant Operator Selection System, offered by the Edison Electric Institute (EEI), reveals the specific content areas and the essential skills that are critical for you to know on the POSS test. We've taken the information and developed a study guide that is guaranteed to help you be successful on the POSS test. Our company's name is Mometrix Test Preparation, and we have a team of standardized test researchers who have worked on developing our study guide for the POSS test. The standards for who gets to work on the team are very strict- we demand the best for our customers, and only those who met our exacting standards made the cut. The dedicated research staff have years of combined experience in mastering the content and skills necessary to succeed on the toughest exams. Some academic studies have revealed that test takers do not really benefit from the traditional test preparation process. But we knew there had to be a solution- if test takers were not doing well on the POSS test despite high intelligence, there had to be a set of secret keys to the test that would open the door of success for these test takers. We created the product in part because we were frustrated by the options available to test takers who really wanted to do well on the POSS test. A common approach is to TEACH the material, instead of TEACHING THE TEST. That's not necessarily good enough for the POSS test- you have to know how to apply the knowledge. Most test takers already have a general knowledge of the material that will be covered on the exam. One reason some test takers do well on the day of the test is that they have made the critical connection between the material they learned and how to use the material to succeed on the POSS test. Get quick, customized help for the questions you have- just send us a quick email and we'll get back to you promptly with the answer. Our researchers are more than just academic theoreticians who understand the technical nature of standardized tests, but are also experts on test taking itself- they reveal the exact skills and the information you'll need to perform under pressure during the test. Before we go any further, let us clarify what Plant Operator Selection System Secrets is not. It is not a stale rehash of all of the things you have already learned in the past. 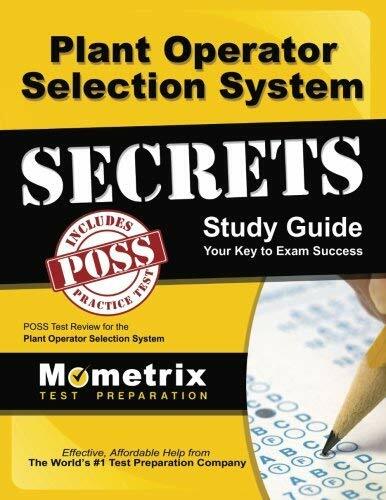 Plant Operator Selection System Secrets is our exclusive collection of the tips and the information that we have specially selected to give you the best results on the POSS test for the least time spent studying. It's written in everyday language and is easy to use. We cover the 5 essential skills necessary to do well on the POSS test, plus comprehensive reviews covering all of the essential test sections individually. Don't take our word for it. Listen to what our customers say about other Mometrix test preparation products. You get at least 10 times your money's worth! --When you consider what's at stake with the exam, we believe the value of our study guide gives you at least ten times your money's worth.